The world has entered a new digital age. Traditional IT services are no longer generating jobs as they once used to. The push towards digital technologies has become more relevant to an increasing number of IT companies today. Going digital means adopting new business verticals like Digital Marketing, Mobile Applications, Data Analytics, Machine Learning, Artificial Intelligence and Cloud Infrastructure. Out of these, Data Analytics and Machine Learning play an extensive role in generating valuable insights for a company from it’s raw data. This leads to Business Intelligence (BI) – A set of best practices using tools and techniques to get insights from raw data collected from various sources. It generates valuable information that can be used to influence business decisions made within the company. Thus, companies have realized the immense benefits that a well implemented BI solution can have for them. Business intelligence creates an holistic idea of data by storing and integrating data from multiple sources into one usable format. The idea is to make the data readily available for reporting, analysis and planning. The raw data can come from a multitude of sources – Excel files, CSV files, databases, website API’s, RSS feeds, Social Media etc. All of these data can be analyzed by BI tools like Microsoft’s Power BI and Tableau. The data is sourced, cleaned and organized by data scientists. They spend around 60% of their time just cleaning and organizing data. Next, they look for patterns or insights in this data that can be presented in a visually appealing form – in the form of charts and tables with filters. This is called Data Visualization. The information that is gathered from raw data is presented as reports or as a Powerpoint presentation containing clearly defined information in various types of charts and tables. Colors, bars, lines, dots, ribbons etc. are used to prove that business decisions need to be made or altered to ensure sustainability and customer retention. Through BI, businesses can also become more popular by going the extra mile to ensure that the customer is impressed – more than satisfied. Machine learning is used to predict future trends based on the analysis of present data. Raw data is first cleaned and processed to get structured data that is ready for input to machine learning algorithms. Publicly available algorithms can be used or new ones can be created. A model is created using the structured data run through the algorithm. This model is perfected using new data by training the model to detect patterns in data. The perfected model is then used to make predictions based on past patterns in data. For example, on amazon.com, our product browsing patterns, wishlist, shopping cart and bought products are analyzed to give us “product recommendations” that we can see below the description of a product. Also, machines can be trained to recognize images and videos – this is what Amazon Rekognition does. What questions will you ask of your data? A simple example: if you are running a school, you will want to know what percentage of students failed in Biology, in Class XII A, in the final exam, in 2017. For this, we can analyze the school results using standard BI tools. 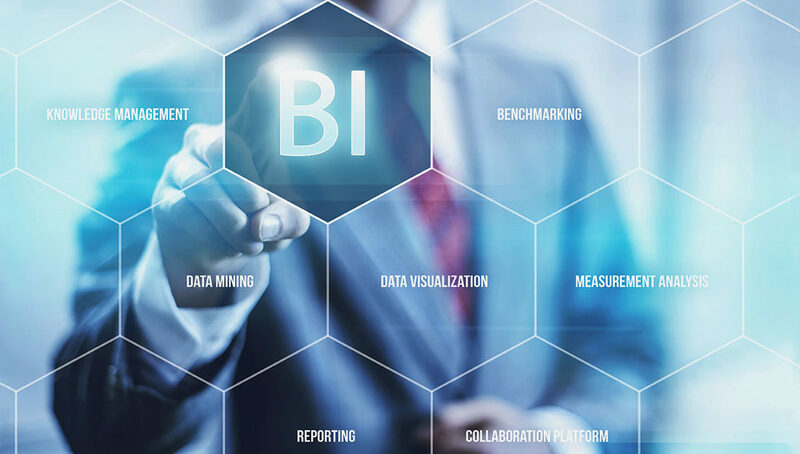 BI tools can be used in various scenarios like Sales analysis, Inventory and Supply Chain analysis, Production analysis and Financial analysis. Cloud BI is a better option than desktop BI as it enables access to information at any time, anywhere in the world. Cost, time and data security are also important factors to consider when choosing a BI solution. An ideal BI solution should support mobile devices also. For example, Power BI has mobile apps for Android and iOS. May the power of business intelligence enable you to overcome obstacles and streamline your business processes to achieve lasting success!